9 The song ‘Smoke on the Water’ was written by Deep Purple and refers to the fire that took place at the Montreux Casino during Frank Zappa’s concert in the 1971 Festival. Montreux is at the opposite end of Lake Geneva from the WTO. As the article explains, the gap between the tariff limits countries have agreed to under the WTO - "tariff bindings" - and the tariffs they actually impose is known as the "tariff water." This means that, in practice, countries could raise many tariffs without violating their WTO commitments. After accounting for tariff bindings that are above prohibitive levels and the constraints of regional trade agreements, the paper looks whether countries have used their available "policy space" to increase protection during the global recession (and finds that, generally, they haven't very much). Or, one might say they decided not to go (Policy) Space Truckin'. For a follow-up, might I suggest: Woman from (the) Tokyo (Round) ? If you think you're not familiar with "Smoke on the Water," after the first 20 or so seconds of this you will realize that you are (its the holy trinity of rock). Also: Space Truckin' and Woman from Tokyo. Mervyn King, governor of the Bank of England, has stepped way over the line by turning into a cheerleader for the current government’s policies. He’s wrong on the economics — front-loaded spending cuts are the wrong policy for a still-depressed economy — but that’s not the key point; rather, the point is that if you’re going to have an independent central bank, the people running that bank have to be careful to stay above the political fray. "The last thing you ever want is for the Bank of England to be drawn into the political arena," said Balls, who was involved in Labour's move in 1997 to give the Bank independence to set interest rates. "Central bank governors have to be very careful about tying themselves too closely to fiscal strategies, especially when they are extreme and are making their job on monetary policy more complicated." One of the things that comes with central bank independence is the expectation that central bankers should be neutral technocrats who keep a narrow focus on monetary policy. In part, this is because central bank independence is a fragile thing, which could be undone by a change to the Federal Reserve Act in the US, or, in the UK, the Bank of England Act. While respect for the principle of central bank independence - exemplified by the fact that Greenspan and Bernanke, both Republicans, were re-nominated by Democratic presidents - has evolved over time, it could be eroded if the central bank was seen to be a partisan actor. 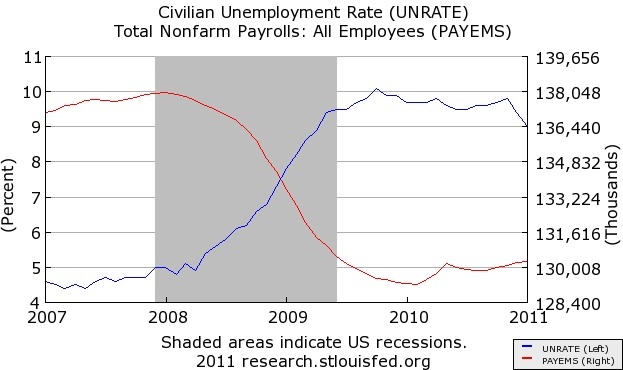 However, I have a bit more sympathy for Governor King than Krugman and Balls do. Central bankers face a dilemma because, while they are rightly expected to stay out of "politics" generally, fiscal policy and monetary policy are interdependent. The central bank is responsible for one part of a fiscal and monetary "policy mix," and its decisions depend on (and are constrained by) the government's tax and spending decisions, and vice-versa. In the UK, the Bank of England is accommodating "tight" fiscal policy with "loose" monetary policy. To a slightly less dramatic degree, this also occurred between the Clinton administration and the Greenspan Fed in the early 1990's. The early 1980's saw the opposite mix in the US: simultaneously tight monetary policy and loose fiscal policy. While the monetary tightening was seen as necessary to bring inflation under control, it probably wouldn't have had to have been so severe if the Reagan administration's tax cuts and spending increases weren't occuring at the same time. Since the ultimate impact of a fiscal policy depends on how monetary policy will react, the political system, in theory, could make better-informed decisions if the central bank communicated its views and intentions. Moreover, because monetary policy has to react to fiscal policy, it is arguably legitimate for the central bank to have preferences about it. The argument Krugman and Balls are making implies that the benefits from a more explicit coordination of monetary and fiscal policy, which requires central banks to speak about fiscal policy, is outweighed by the damage to central bank independence that occurs when central bankers like King express themselves on "political" tax and spending matters. Another day brings more evidence that inflation in China may be taking care of the undervalued renminbi problem (see this previous post). In adjusting current accounts, what matters is the real exchange rate (which takes account of relative inflation rates at home and abroad). Movements in nominal exchange rates often do not achieve the desired adjustment in real rates because they may be offset by changing domestic prices. For example, the yen’s trade-weighted value is around 150% stronger than it was in 1985. Yet Japan’s current-account surplus remains big because that appreciation has been largely offset by a fall in domestic Japanese wholesale prices, so exporters remain competitive. An alternative way to lift a real exchange rate is through higher inflation than abroad. To an American buyer, a 5% increase in the yuan price of Chinese exports is the same as a 5% appreciation of the yuan against the dollar. 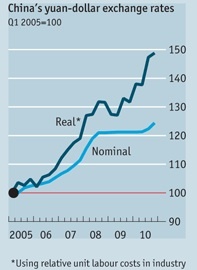 [G]iven China’s history of hyperinflation, it would be far better to adjust via the nominal rate. It has always surprised me that they seem to prefer to do part of it through inflation. And now that they are really worried about inflation, which has become the focal point of their economic policy, this would be the perfect time for them to let the currency adjust. They know the currency is going to adjust over time anyway and it is better to let it happen through the nominal rate. At the same time, it’s an ideal time for us if they make the move now because it will help rebalance our external accounts and help deal with our high unemployment. From the standpoint of both sides there couldn’t be a better time to adjust the nominal exchange rate for the renmimbi. See also Bergsten's commentary "A Breakthrough on the Renminbi?" at the Peterson Institute's blog. A current account deficit occurs when investment is greater than domestic saving - the gap is filled by selling assets to the rest of the world. Although it is commonplace to criticize deficit countries for low savings - and the savings rate in the US did indeed become very low - Bernanke argued in 2005 that the US current account deficit was driven by foreign savings. The financial inflows stemming from the foreign "savings glut" drove up the prices of US assets (including bonds, thereby driving down interest rates), and the decline in US savings followed from the resultant increase in wealth. As a share of GDP, the US current account deficit peaked at just over 6% of GDP in early 2006. I today's speech, Bernanke cites evidence that there was strong international demand for "safe" US assets, which supports his 2005 hypothesis. The preferences of foreign investors for highly rated U.S. assets, together with similar preferences by many domestic investors, had a number of implications, including for the relative yields on such assets. Importantly, though, the preference by so many investors for perceived safety created strong incentives for U.S. financial engineers to develop investment products that "transformed" risky loans into highly rated securities. Remarkably, even though a large share of new U.S. mortgages during the housing boom were of weak credit quality, financial engineering resulted in the overwhelming share of private-label mortgage-related securities being rated AAA. The underlying contradiction was, of course, ultimately exposed, at great cost to financial stability and the global economy. To be clear, these findings are not to be read as assigning responsibility for the breakdown in U.S. financial intermediation to factors outside the United States. Instead, in analogy to the Asian crisis, the primary cause of the breakdown was the poor performance of the financial system and financial regulation in the country receiving the capital inflows, not the inflows themselves. In the case of the United States, sources of poor performance included misaligned incentives in mortgage origination, underwriting, and securitization; risk-management deficiencies among financial institutions; conflicts of interest at credit rating agencies; weaknesses in the capitalization and incentive structures of the government-sponsored enterprises; gaps and weaknesses in the financial regulatory structure; and supervisory failures. Ouch. That's harsh, though he could take the Asia analogy one step further - as Simon Johnson does - and acknowledge that the "breakdown" in the US was partly because we have our own form of "crony capitalism" where the financial industry has, to a degree, captured the regulatory and political system. These issues are hardly new. In the late 1920s and early 1930s, the U.S. dollar and French franc were undervalued, with the result that both countries experienced current account surpluses and strong capital inflows. Under the unwritten but long-standing rules of the gold standard, those two countries would have been expected to allow the inflows to feed through to domestic money supplies and prices, leading to real appreciations of their currencies and, with time, to a narrowing of their external surpluses. Instead, the two nations sterilized the effects of these capital inflows on their money supplies, so that their currencies remained persistently undervalued. Under the constraints imposed by the gold standard, these policies in turn increased deflationary pressures and banking-sector strains in deficit countries such as Germany, which were losing gold and foreign deposits. Ultimately, the unwillingness of the United States and France to conduct their domestic policies by the rules of the game, together with structural vulnerabilities in financial systems and in the gold standard itself, helped destabilize the global economic and financial system and bring on the Great Depression. In his central banker-ly caution, he refuses to name names, but he's obviously alluding to China's policy of keeping renminbi undervalued. Although he has a knack for giving very comprehensive speeches sometimes, there are some important closely-related issues that Bernanke did not touch on this time. In particular, the demand for US assets was partly due to the fact that the dollar is the most widely-used "reserve currency" (i.e., held in official portfolios). This periodically generates complaints from the rest of the world (and for the US, its a mixed blessing), but Bernanke did not point to any alternative. Nor did he suggest that it gives the US any special responsibility (and, personally, I don't believe that it does). Also, one significant motive for reserve accumulation is self-insurance - countries burned by reliance on inflows of foreign savings decided to build up their own. An better international insurance mechanism would reduce that need. In theory, that is part of what the IMF is supposed to provide. Update: A nice response to the gold standard analogy from Free Exchange. Middletown, Connecticut. Middletown’s allure includes an artful Main Street brimming with elegant restaurants, an award-winning local chocolatier, and the romantic Inn at Middletown, offering the best of New England charm. Not to mention the drama of our collapsing buildings! When I introduce the GDP figures to my macroeconomics students, I point out that the federal government accounts for a much smaller portion of the economy than many believe. 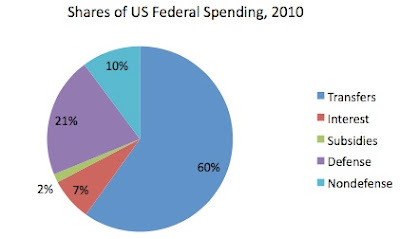 Federal government purchases - i.e., the federal part of G in the national income accounts - was 8.3% of GDP in 2010, and more than two-thirds of that was military spending. The federal nondefense part - all the stuff that we think of as "the federal government" like the FBI, NASA, the State Dept. and so on - was a mere 2.7% of GDP. One reason that people think that the federal government is larger is that federal spending was $3.7 trillion last year, which would be 26.5% of GDP. But most of that is transfer payments - money sent to people (and, to a lesser extent, state governments). Mainly, this is social security and medicare. In the national income accounts, most transfers end up in the "C" (consumption) component of GDP when the recipients spend the money. The chart below, from BEA data, illustrates that nondefense federal government purchases are only about 10% of federal spending. That is, the turquoise pie slice is $396.6 out of $3890.6 billion. So when zealous congressional republicans say that they are going to cut our "big government" by $100 billion*, the consequences are quite severe because the cuts almost entirely come out of that small slice. This analysis by the Center on Budget and Policy Priorities provides some of the bloody details, including cuts of 12.7% in Labor, Health and Human Services and Education, 14.5% in Interior and Environment and 26.1% in Transportation and Housing and Urban Development. *It depends on how you measure it; as the CBPP analysis explains, the "$100 billion" figure is relative to the president's proposal and is for an entire fiscal year (which runs from October through September), while the cuts are for the remainder of fiscal 2011. The CBPP analysis comes to my attention via the invaluable Ezra Klein. Update: Paul Krugman has more. Update #2: So does Bruce Bartlett. If you have a classical view of the world, you would argue that nominal shocks should affect the nominal, not the real exchange rate: the real exchange rate is a real phenomenon, and money is a veil. Specifically, you’d expect any nominal shock to move the price level by the same amount that they move the exchange rate. You can, if you’re desperate, try to explain this away by saying that there was some fundamental structural change in the early 1970s, but at that point you’re deep into epicycle territory. And there’s more — for example, Ireland went abruptly from having a stable real exchange rate against the UK to having a stable rate against Germany when it joined the European exchange rate mechanism, etc..
A paper of mine in the October 2010 issue of Economic Inquiry adds to the "and there's more" evidence. 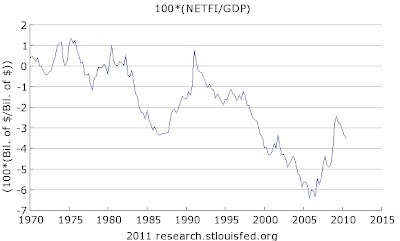 It looks at the US-UK real exchange rate over 1794-2005, during which the nominal exchange rate switches from fixed to floating and back a number of times (5 floating periods and 4 fixed periods). 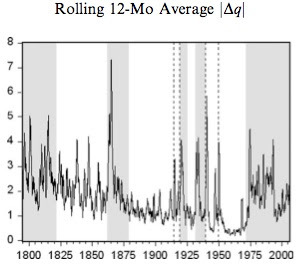 In this graph of the rolling average of the absolute monthly change, one can see that the real exchange rate is more volatile in floating (shaded) periods than in the adjacent fixed rate periods (the dashed lines denote the periods of government controls around the two world wars). The biggest change in volatility is after Bretton Woods ends in 1971. In earlier periods, the differences in real exchange rate behavior between fixed and floating regimes are not as stark, but they are there (there's more evidence in the paper). That suggests that the classical assumption of money neutrality is invalid (in the short run), but it may have been less so in the 19th century than it is now. Incidentally, I believe the Mussa paper Krugman is referring to is in the Carnegie-Rochester Conference Series in 1986 (vol. 25) (subscription required). According to the Bureau of Labor Statistics, there was a significant drop in the unemployment rate, from 9.4% to 9.0%, in January while payrolls increased by a meager 34,000. 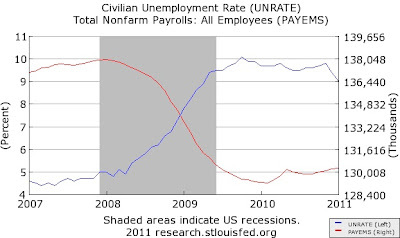 The two figures sometimes give conflicting indications because they are drawn from different data: the unemployment rate is calculated from a survey of households, while the payroll number comes from a survey of firms. The interpretation is further complicated this month by several other factors, including a revised estimate of the population, and the possible impact of unusually severe January weather. Calculated Risk, the Times' David Leonhardt, the Economist's Greg Ip, John Hilsenrath of the WSJ, and Real Time Economics' round-up of assorted pundits provide some guidance in sorting out the numbers. 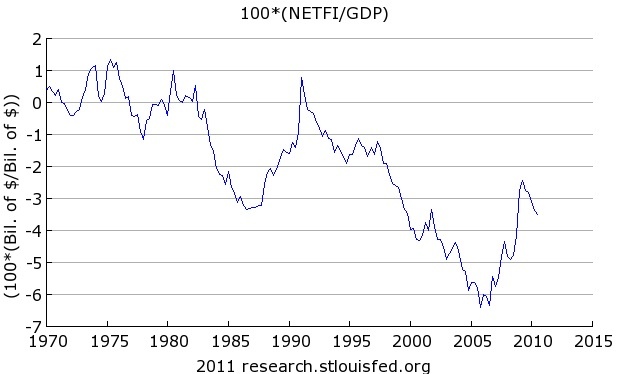 Overall, it looks like the news is consistent with a picture of a recovery gaining momentum, but with a long way to go. Hopefully the February report, which is due on March 4, will give a clearer picture.